Safely ship perishables or medical specimens requiring insulation. 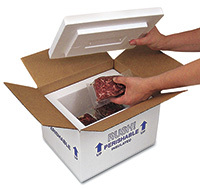 Tight fitting lid and seamless molded polystyrene body help maintain a constant cool temperature. Corrugated box is preassembled around foam insert for added durability. Dimensions listed are usable dimensions. Wall thickness is 1".